Cranberry Christmas Fluff! Tart-sweet cranberries, marshmallows that become little sponges and the crunch of pomegranate seeds make this the best holiday side around! Place the cranberries and sugar in a blender or food processor. Blend until smooth, scraping down the sides as needed. Drain the crushed pineapple in a colander, pressing on the fruit to extract as much liquid as possible. Add the cranberry mixture, crushed pineapple and cocowhip to a bowl. Gently fold to combine. Add the marshmallows and gently stir in. Pour the mixture into a serving dish. Let sit for at least 6 hours and up to overnight. 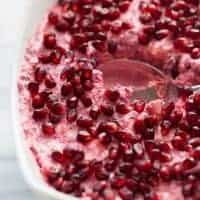 Top with pomegranate seeds. Enjoy!